Four players limped in the first hand and many would continue to do the same. Later, when a loose and fishy player made a string raise, the dealer stopped him. In protest, the player delayed so long before playing his next hand preflop that someone called the clock without any previous action having been made. He tried this for a couple more hands, then gave up. I couldn’t have scripted a more perfect lineup. The cards, however, would prove to be my worst enemy. I held on for about three hours, but connected with too few boards. I was eliminated after raising KJ preflop, getting called by the blinds and calling off against the small blind’s KT on a KTQ flop. Another finish out of the money, but I remained determined to finish with a bang. Bellagio’s 2p.m. 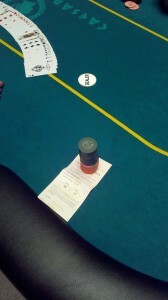 event on Tuesday was a $125 buy-in that gave me a similar 10,000 chip starting stack. Of that entry fee, $97 goes into the prize pool, and the casino collects $28. At 50/100, the blinds started a little higher than other events, but the 25-minute levels offered more play. Doyle Brunson sat behind the glass inside Bobby’s Room, betting in one hand more than the prize that this entire field is chasing. The 54 players would fight for $1,781, and it was a peculiar battle, filled mostly with older tourists. Shortly after the start, I was moved to a table loaded with calling stations. Some raised pots would see 6-way action preflop. But yet again, I struggled to make hands and take down relatively big pots. With more than half the field eliminated, I busted after I was forced to move in with QJ and could not outdraw AK. And it was over, 0 for 7. A week of whiffs. If I could have taken one down or at least cash in a couple, that easily would have covered the $830 I spent. Cut another way, I paid $171 in tournament fees in one week, meaning more than 20 percent goes to the house. It would certainly be a grind to exclusively play these tournaments, but there’s lots of cash out there. And I intend to get some of it. I’m going to give a few of these another shot — Aria, Bellagio, Caesars and Stratosphere will definitely see me again — and check out some other regular events around Vegas. If you’re playing a daily or nightly tournament and you see me at your table, look out, because my luck’s about to change! It should be noted that on Saturdays and Sundays the Caesars nightly is NOT a $5k guarantee. A friend of mine discovered this the hard way last night. So if you’re looking for an overlay, play Monday through Friday. duly noted. made an edit in the initial copy for those who don’t make it this far down.